For the settlement within the City of Canterbury, see Canterbury. For the local government area in Australia, see City of Canterbury (New South Wales). The City of Canterbury (/ˈkæntərbəri/) is a local government district with city status in Kent, England. The main settlement in the district is Canterbury. ✪ City Centre, Canterbury, Kent. 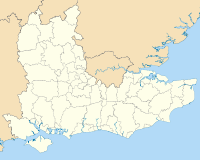 The district was formed on 1 April 1974 by the merger of the existing city of Canterbury with the Whitstable and Herne Bay Urban Districts, and Bridge-Blean Rural District. The latter district entirely surrounded the city; the urban districts occupied the coastal area to the north. Swalecliffe is an unparished area within the district. The area is largely rural, with a coastal strip taken up by the almost unbroken spread of seaside towns and beautiful beaches from Seasalter, west of Whitstable, to Herne Bay, Kent. Between them and the city, the hills rise into the well wooded historic Blean, south of which is the Great Stour flowing from its source beyond Ashford. The district participates in the Sister Cities programme, with links to Bloomington-Normal, Illinois, United States and Vladimir, Russia. The Three Towns Association was founded in 1985 on the initiative of three local clergymen to promote person to person contact between ordinary people in the then USSR, the UK, and the US. The association is the only twinning between the new District Council (i.e. including Whitstable and Herne Bay) as distinct from the old city council for Canterbury alone. The name was subsequently changed to the Three Cities Association. Several towns and villages within the City of Canterbury district have their own twinning arrangements; see in particular Canterbury, Whitstable and Herne Bay. ^ "Canterbury". Collins Dictionary. n.d. Retrieved 24 September 2014. ^ "Parish Councils". Canterbury City Council. 2008. Archived from the original on 15 August 2010. Retrieved 5 September 2010.